To Cite: Tanriverdi H, Erboy F, Altinsoy B, Uygur F, Arasli M, et al. 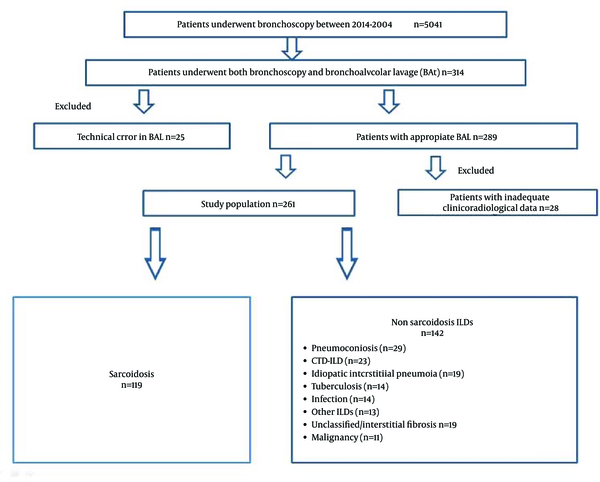 Bronchoalveolar Lavage Fluid Characteristics of Patients With Sarcoidosis and Nonsarcoidosis Interstitial Lung Diseases: Ten-Year Experience of a Single Center in Turkey, Iran Red Crescent Med J. 2015 ; 17(10):e31103. doi: 10.5812/ircmj.31103. Background: Bronchoalveolar lavage (BAL) is a noninvasive and useful technique for evaluating interstitial lung diseases (ILDs). Flow cytometric analysis of BAL fluid reveals specific diagnostic information in some unusual ILDs, and helps to narrow down the possible causes of interstitial diseases in most patients with more common disorders. A high BAL CD4/CD8 ratio is highly specific for sarcoidosis but can also be seen in other ILDs. Objectives: In this retrospective, descriptive, cross-sectional study, we compared BAL fluid characteristics and clinical variables in patients with sarcoidosis and non-sarcoidosis ILDs in a large cohort. Patients and Methods: The study was conducted in a tertiary university hospital in Zonguldak, the biggest city of the western Black Sea region of Turkey. Between 2004 and 2014, all patients who underwent both fiberoptic bronchoscopy and BAL with a suspicion of ILD were included in the study, retrospectively. Patients were divided into two main groups: sarcoidosis and non-sarcoidosis ILDs. Non-sarcoidosis ILDs were further divided into subgroups: pneumoconiosis, tuberculosis (TB), collagen vascular diseases, idiopathic interstitial pneumonias, malignancies, and unclassified ILDs. The clinical data of patients, including age, gender, smoking status, pulmonary function tests, and BAL flow cytometric analysis results, were compared among groups. Results: In total, 261 patients (119 sarcoidosis and 142 non-sarcoidosis ILDs) were enrolled. The median (interquartile range) BAL CD4/CD8 ratio and lymphocyte fraction were significantly higher in sarcoidosis than in non-sarcoidosis ILDs: 3.88 (3.76) versus 0.88 (1.01), respectively, and 20.6 (28.3) versus 6.0 (13.7), respectively. T cell receptor γ delta, CD16+56+, CD103+, CD8+103+, and CD3+16+56+ cells were significantly lower in sarcoidosis than in non-sarcoidosis ILDs. The median BAL CD4/CD8 ratios were significantly higher in patients with TB (1.87, P = 0.01) and malignancies (1.69, P = 0.03) than in other non-sarcoidosis ILDs. Conclusions: Among BAL fluid flow cytometric parameters, CD4/CD8 and lymphocyte fraction may be helpful for distinguishing sarcoidosis from other ILDs, but they are neither specific nor diagnostic for any lung disease. Thus, a multidisciplinary diagnostic discussion is required to differentiate various ILDs. Bronchoalveolar lavage (BAL) can sample cells and solutes from the lower respiratory tract, and thus it has become a standard diagnostic procedure in all patients with unclear diffuse lung abnormalities, whether an infectious, non-infectious, immunological, or malignant etiology is suspected (1-3). BAL fluid obtained from healthy individuals who have never smoked typically contains mostly alveolar macrophages (80 - 90%), followed by lymphocytes (5 - 15%), and neutrophils (< 3%) or eosinophils (< 1%) (4, 5). Interstitial lung diseases (ILDs) include respiratory tract disorders of unknown etiology in most cases; their clinical courses differ (1) and their prognoses are generally serious and associated with substantial morbidity and mortality (6). Known etiologies and associations with ILDs include pneumoconioses, connective tissue diseases associated with ILD (CT-ILD), and hypersensitivity pneumonitis (HP). ILDs of unknown etiology include sarcoidosis and idiopathic interstitial pneumonias (IIP) (5). The diagnosis of IIP requires exclusion of known causes of ILDs, such as drug or inhalational exposure and CTDs. A multidisciplinary diagnosis is the gold standard for diagnosing IIP (7). Analyses of total and differential counts of inflammatory cells and the CD4/CD8 ratio in BAL fluid reveal specific diagnostic information in some unusual ILDs, and help to narrow down the possible causes of diseases in most patients with more common disorders, such as sarcoidosis, HP, and eosinophilic pneumonia (8, 9). In healthy individuals, the CD4+/CD8+ lymphocyte ratio is 1.0 - 3.5, with average values ranging between 1.5 and 2.0 (2). Strong correlations have been reported between age and lymphocyte subsets in BAL fluid (10). Elderly subjects tend to have increased levels of lymphocytes and neutrophils and an elevated CD4/CD8 ratio in BAL fluid, suggesting that advanced age may affect BAL cell differentials (2, 4, 10). BAL is a noninvasive diagnostic procedure for ILDs; the diagnosis of certain non-IIP diseases, such as HP, sarcoidosis, and pulmonary alveolar proteinosis; and the exclusion of infection or malignancy (11). However, in the majority of cases, the results of BAL fluid examinations only provide additional information, and cannot be the basis for a definitive diagnosis of ILDs (1). A BAL CD4/CD8 ratio > 3.5 is highly specific for sarcoidosis but can also be seen in various diseases, including tuberculosis (TB) and malignancies. In this retrospective study, we assessed the clinical and demographic data of patients with ILDs and compared the BAL fluid features of patients with different ILDs, such as sarcoidosis, IIPs, CT- ILD, pneumoconiosis, TB, and other ILDs. This study was retrospective, descriptive, and cross-sectional, and was conducted at Bulent Ecevit University Faculty of Medicine Hospital (formerly Karaelmas University), Zonguldak, Turkey, in 2014. The hospital is a tertiary teaching and research hospital that serves as a referral hospital for the region of the western Black Sea. The pulmonary diseases department has 21 beds in wards and 11 beds in a respiratory intensive care unit. This study was approved by Clinical Research Ethics Committee of Bulent Ecevit University (decision number: 2014/17, approval date: 16-09-2014). All of the interventions were aspects of routine clinical evaluations for suspected ILDs; none of them were made for clinical research. Patient privacy was observed during the study period. We investigated all fiberoptic bronchoscopy (FOB) records retrospectively between 2004 and 2014. In total, 5041 patients underwent FOB between 2004 and 2014. Of these, we included 314 patients who underwent both FOB and BAL for suspected ILDs; however, 53 were excluded because of inadequate data or technical errors in BAL sampling (Figure 1). Therefore, 261 patients were included in the study. Medical records of patients were investigated using the hospital’s automated system. Demographic and clinical data of patients, such as age, gender, smoking status, pulmonary function test results (routine spirometry and diffusing capacity of carbon monoxide [DLCO]), BAL flow cytometry (FC), and cytopathology and/or histopathology results (if a biopsy was obtained), and final diagnoses were recorded. Pulmonary function tests were performed using a Jaeger Masterscreen PFT (Erich Jaeger GmbH, Hoechberg, Germany), which was calibrated daily. The patients were classified as sarcoidosis and non-sarcoidosis ILDs; the non-sarcoidosis ILDs were further subgrouped as pneumoconiosis, CT-ILD, IIPs, TB, malignancy, infection, and unclassified interstitial fibrosis. Clinical variables were compared among groups. BAL is usually part of our routine clinical evaluation in all patients with suspected ILDs, if not contraindicated. BAL was performed in accordance with guidelines (2, 3, 5): a flexible bronchoscope (Olympus BF, Type 1T160 or P160, Olympus, Tokyo, Japan) was moved to the area of the greatest radiological abnormality seen on high-resolution computed tomography of the chest or in the right middle lobe or lingula in the presence of diffuse involvement. At least three aliquots of 40 mL sterile saline at room temperature were instilled through the FOB, and retrieved gently by mechanical suction. The standard volume used in most patients was 120 mL (maximum, 200 mL). Only the second aliquot was used for BAL analysis. All of the patients were newly diagnosed at the time the BAL was performed, and none of them had received steroid treatment before the BAL was performed. BAL fluid cells were washed in phosphate-buffered saline (PBS), resuspended at 1 × 106 cells/mL in 0.1% bovine serum albumin in PBS, and stained with the following antibodies: CD14-PE, CD45-FITC, CD4- PC5, CD8-PE, CD3-FITC, CD3-PE, CD103-FITC, CD19-PE, TCR γ delta-FITC, and CD16+56-PE. Isotype-matched antibodies were used as negative controls. All of the antibodies were purchased from Beckman Coulter (Fullerton, CA, USA). Following staining and incubation at room temperature, samples were immediately analyzed by flow cytometry (Beckman Coulter, FC500). Data from at least 10,000 cells were recorded for each tube. Standardized gating was performed without any clinical information about the individual patients. Statistical analyses were performed using the SPSS software (ver. 19.0; SPSS Inc. Chicago, IL, USA). Normality of the data was assessed with the Shapiro-Wilk test. Continuous variables are presented as means ± Standard Deviations or medians (interquartile range), and categorical variables are presented as frequencies and percentages. Pearson’s χ2 or Fisher’s exact tests were used to compare categorical variables. The independent-samples t-test or the Mann Whitney U test was used to compare continuous variables between the groups, and analysis of variance (ANOVA) or the Kruskal-Wallis test was used to detect differences among three or more groups. A P value < 0.05 was considered statistically significant. In total, 261 patients (119 sarcoidosis and 142 non-sarcoidosis ILD, mean age 52.3 ± 13.3 years) were enrolled. The demographic and clinical data of patients are shown in Table 1. The median value of DLCO (% predicted), forced vital capacity (FVC), and forced expiratory volume in the first second (FEV1) were significantly lower in non-sarcoidosis ILD than in sarcoidosis patients (Table 1). Of the non-sarcoidosis ILD patients, 67% showed mild to severe impairment of pulmonary function (DLCO ≤ 80% predicted). A restrictive pattern was observed in 49% of non sarcoidosis ILD patients, whereas 77% of sarcoidosis patients had normal spirometry. Although normal spirometry results were observed in most sarcoidosis patients, half of them showed mild to moderate decreases in DLCO (Table 1). The median BAL lymphocyte fraction was significantly higher in sarcoidosis than in non-sarcoidosis ILDs (20.6% and 6.0%, respectively), whereas the BAL neutrophil percentage was significantly lower (11.2% and 16.4%, respectively; p values for both < 0.001). aValues presented as mean ± SD, or median (min-max). babbreviations: c = current smoker, n: never smoked, CRP: C-reactive protein, DLCO: Diffusion capacity of lung for carbonmonoxide, Smoking status, e: exsmoker. ESR: Erytrocyte sedimantation rate, FEV1: Forced expiratory volume in first second. FVC: Forced vital capacity. cValues are presented as No. (%). As expected, the median CD4/CD8 ratio in BAL fluid was significantly higher in sarcoidosis than in non-sarcoidosis ILDs: 3.87 (range, 0.46 - 20) and 0.88 (range, 0.1 - 9.2), respectively (P < 0.001). Levels of T cell receptor (TCR) γ delta, CD16+56+, CD103+, CD8+103+, and CD3+16+56+ lymphocytes were significantly lower in sarcoidosis than in non sarcoidosis ILDs. Levels of CD3+103+ and CD4+103+ lymphocytes were not significantly different between non-sarcoidosis ILD and sarcoidosis groups (Table 2). aAbbreviations: NS ILD: Nonsarcoidosis interstitial lung diseases, TCR: T cell receptor. bValues presented as median (min-max). BAL fluid analysis of patients in the subgroups of ILD patients revealed only significantly higher CD4/CD8 ratios in patients with TB and malignancies compared to the other subgroups of non-sarcoidosis ILDs. There were no significant differences among the subgroups of ILDs in terms of median percentage of BAL lymphocytes or neutrophils, CD16+56+, CD3+16+56+, or TCR γ delta (Table 3). No significant differences were seen between TB and malignancy patients in terms of CD4/CD8 or other BAL fluid parameters. The CD4/CD8 ratio was higher than 2.5 in 21.4% of TB patients, 67.2% of sarcoidosis patients, and 27.3% of malignancy patients (Table 4). aValues presented as median (interquartile range). babbreviations : CT-ILD, Connective tissue associated interstitial lung diseases; IIP, Idiopathic interstitial pneumonia; TB, Tuberculosis, Pnmcns, pnuemoconiosis. cIIPs: 13 patients idiopathic pulmonary fibrosis, 3 patients idiopathic nonspecific interstitial pneumonia, 2 patients cryptonised organizing pneumonia, 1 patient acute interstitial pneumonia. ddifference is significant for tuberculosis vs IIPs (P = 0.03), vs. CT-ILD (P = 0.021), vs. other ILDs (P = 0.011), vs. unclassified/fibrosis (P = 0.035). edifference is significant for malignancy vs. IIPs (P = 0.029), vs. CT-ILD (P = 0.005), vs. other ILDs (P = 0.002), vs. unclassified/fibrosis (P = 0.005), vs. pneumoconiosis (P = 0.013), vs. infection (P = 0.025). fOther ILDs: 4 patients hypersensitivity pneumonia, 3 patients: Respiratory bronchiolitis ILD, 2 patients drug/medicine associated ILD, 2 patients pulmonary alveolar proteinosis, 1 patient eosinophilic granuloma, 1 patient lymphocytic intersititial pneumonia, 1 patient; Lymphangioleiomyomatosis, Malignancy: 1 patient kaposy’s sarcoma, 1 patient multipl myeloma, 3 patients lymphoma, 6 patients primer or metastastic lung cancer. Pneumoconiosis 5 patients Silicosis, 24 patients coal worker’s pneumonoconiosis. CT-ILD: 9 patients rheumotoid arthritis, 5 patients systemic lupus eritematosus, 3 patients sjogren’s syndrome. 2 patients scleroderma, 2 patients polymyositis/dermatomyositis, 2 patients ancylosing spondilytis. aAbbreviations: BAL, Bronchoalveolar lavage; CT-ILD, Connective tissue associated interstitial lung diseases; ILD, Interstitial lung disease. In this retrospective study, the BAL lymphocyte fraction and CD4/CD8 ratio were significantly higher in sarcoidosis patients than in non-sarcoidosis ILDs, whereas the neutrophil fraction and levels of TCR γ delta, CD16+56+, CD103+, CD8+103+, and CD3+16+56+ lymphocytes were significantly lower. However, no significant differences were found between sarcoidosis and non-sarcoidosis ILD patients in terms of the levels of CD3+103+ or CD4+103+ lymphocyte subgroups. Among non-sarcoidosis ILDs, only the CD4/CD8 ratio was significantly higher in patients with TB and malignancies compared to other non-sarcoidosis ILDs. Several studies have shown that the BAL CD4/CD8 ratio and lymphocyte fraction are higher in sarcoidosis than in non-sarcoidosis ILD patients (2, 9, 12-18). Similar to our results, Suzuki et al. (16) showed that the BAL CD4/CD8 ratio and lymphocyte fraction were significantly higher in sarcoidosis patients than in CT-ILD, IPF, and healthy subjects (4.25 versus 1.46, 1.44, and 2.15, respectively, and 33.1% versus 22.6%, 29.7%, and 10.3%, respectively). In a recent study that included 51 sarcoidosis and 132 non-sarcoidosis patients (9), the BAL lymphocyte fraction and CD4/CD8 ratio were 2.5 - 3 fold greater in sarcoidosis than in non-sarcoidosis ILD patients. In contrast to our results, Mota et al. (19) reported a significantly higher BAL lymphocyte fraction in non-sarcoidosis ILDs than in sarcoidosis ILDs (54% and 34.8%, respectively). However, in their study, nearly 50% of the non-sarcoidosis ILDs were HP. In our study population, only four patients (3% of the non-sarcoidosis ILDs) were diagnosed with HP. An elevated total cell count in the BAL fluid of patients with ILD is common (20). Increased levels of neutrophils in BAL fluid are correlated with disease severity and prognosis for both HP and IPF, whereas eosinophilia of BAL fluid has been linked to more severe disease and worse prognosis in IPF. In our patient population, the median neutrophil count in BAL fluid was higher in IIP patients, but the difference was not significant. Drent et al. (21) investigated the initial BAL of 2,008 patients with sarcoidosis, HP, and IPF during a 10-year period, and reported high absolute and relative numbers of lymphocytes in the sarcoidosis and HP groups, high numbers of plasma cells and mast cells in the HP group, and an increased number of neutrophils and eosinophils in the IPF group. Welker et al. (22) studied 436 patients diagnosed as having one of four major ILDs (sarcoidosis, UIP, HP, or NSIP), and demonstrated that when BAL lymphocytes, granulocytes, and CD4/CD8 were combined, a low percentage of lymphocytes and granulocytes and an elevated CD4/CD8 ratio raised the likelihood of sarcoidosis to > 85%. In this study, we assessed the BAL fluid features of patients with non-sarcoidosis ILDs, and found that only the CD4/CD8 ratio differed significantly among subgroups. This ratio was significantly higher in patients with TB and malignancies. Ryu et al. (11) compared 87 UIP and 35 idiopathic NSIP patients with pathologically confirmed diseases (surgical lung biopsies) and found that neutrophil counts in BAL fluid were significantly higher in UIP (7.0%) than NSIP (3.0%), whereas lymphocyte counts were significantly higher in NSIP (29.0%) than in UIP (5.5%). Their study showed that analysis of the differential white blood cell count in BAL fluid was useful not only for separating NSIP from UIP but also for predicting the prognosis in patients with fibrotic IIP. In contrast, Veeraraghavan et al. (1) compared UIP and fibrotic NSIP and found no significant or marginal differences in BAL data, such as total cells and differential counts. Two of their patients had a normal BAL differential count, and neutrophil levels were elevated by almost 90% for both UIP and fibrotic NSIP. Another important subgroup in our study population among the non-sarcoidosis ILDs was pneumoconiosis (20% of non-sarcoidosis ILDs). Zonguldak is the biggest coal mining area in Turkey. Thus, a large proportion of our patient population consisted of coalminers. There were no significant differences between pneumoconiosis and the other ILDs in the BAL fluid analysis. In a Turkish study, Kayacan et al. (23) investigated BAL fluid cellular profiles of miners and found that the lymphocyte percentile was significantly lower in miners than in non-smoker controls, but neutrophils were not significantly different. In a retrospective study (24) in which 20 patients with pneumoconiosis were assessed, the mean percentages of lymphocytes and neutrophils in BAL fluid were 22 ± 12.4% and 12.8 ± 15.2%, respectively. TB remains an important public health problem in many developing countries, and assessing the utility of BAL cellular profiles for differentiating sarcoidosis from TB may be of considerable clinical importance. In this study, median CD4/CD8 ratios were significantly higher in sarcoidosis patients than in TB patients. The ratio was significantly higher in TB than in all subgroups of non-sarcoidosis ILDs except malignancies. It was > 3.5 in 21% of TB patients. In a study (25) in which 88 sarcoidosis and 76 TB patients were compared, a significantly high percentage of lymphocytes in BAL fluid was demonstrated (median 30% in sarcoidosis versus 14% in TB). In that study, the value of a high CD4/CD8 ratio as an independent predictor of sarcoidosis was diminished by the scattered CD4/CD8 ratio distribution in TB patients: 29% of the TB patients had values > 3.5. In a recent meta-analysis, Yin et al. (26) reported that the mean ratios ranged between 1.23 and 2.9 in TB patients and 1.2 and 2.6 in healthy controls. Our study had some limitations. First, the study was retrospective; thus, there were some missing data points. Second, the study population was very heterogeneous and the numbers of patients in the groups were not equal. Third, some patients were diagnosed by clinicoradiological methods, and a histopathological confirmation was not made in all patients. Despite these limitations, our study population was relatively large and included various ILDs. In addition, most of the patients were followed for a long time; thus, the diagnoses were confirmed. BAL fluid analysis appears to be helpful for distinguishing sarcoidosis and non-sarcoidosis ILDs when assessed through clinicopathological and radiological evaluations, whereas it does not seem useful for distinguishing among non-sarcoidosis ILD subgroups. BAL fluid parameters, including the number of lymphocytes and the CD4/CD8 ratio, are neither specific nor diagnostic for any ILDs because of the high variability in these values. The authors thank all the patients and clinical investigators who are involved in this study. Authors’ Contributions: Study concept and design: Hakan Tanriverdi, Fatma Erboy, Bulent Altinsoy, Firat Uygur, Mehmet Arasli, Ishak Ozel Tekin, Muge Meltem Tor, Figen Atalay. Acquisition of data: Hakan Tanriverdi, Fatma Erboy, Bulent Altinsoy, Firat Uygur, Mehmet Arasli, Ishak Ozel Tekin, Muge Meltem Tor, Figen Atalay. Analysis and interpretation of data: Hakan Tanriverdi, Fatma Erboy, Bulent Altinsoy, Firat Uygur, Mehmet Arasli, Ishak Ozel Tekin, Muge Meltem Tor, Figen Atalay. Drafting of the manuscript: Hakan Tanriverdi, Figen Atalay, Firat Uygur, Bulent Altinsoy. Critical revision of the manuscript for important intellectual content: Muge Meltem Tor, Figen Atalay, Hakan Tanriverdi, Ishak Ozel Tekin. Statistical analysis: Bulent Altinsoy, Hakan Tanriverdi, Mehmet Arasli. Administrative, technical, and material support: Mehmet Arasli, Hakan Tanriverdi, Firat Uygur, Fatma Erboy. Study supervision: Muge Meltem Tor, Figen Atalay, Hakan Tanriverdi, Ishak Ozel Tekin.